By now it’s a little harder to get them all in frame together. 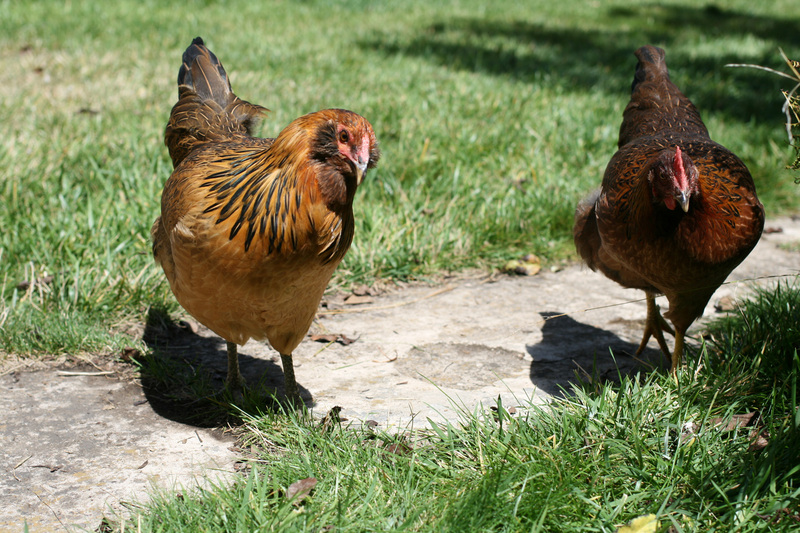 But though they each have their own favorite spot in the yard, they remain best buddies just as they were in the brooder, eagerly inspecting whatever tidbit another has discovered, and notifying the group when anything is amiss. (It’s usually a butterfly. Sometimes it’s a plane. Once it was maybe a hawk.) 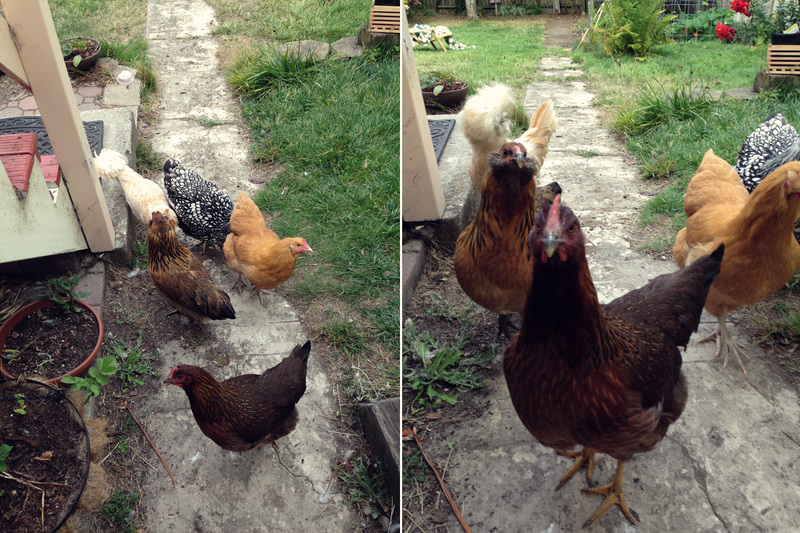 All in all, the girls are quite happy to be having lots more free reign of the backyard these days. They even spent a few hours this week unaccompanied! No free-range incidents so far, other than a few stair-climbers and some confusion about bedtime. Yes yes, beautiful birds, oh the fun times! 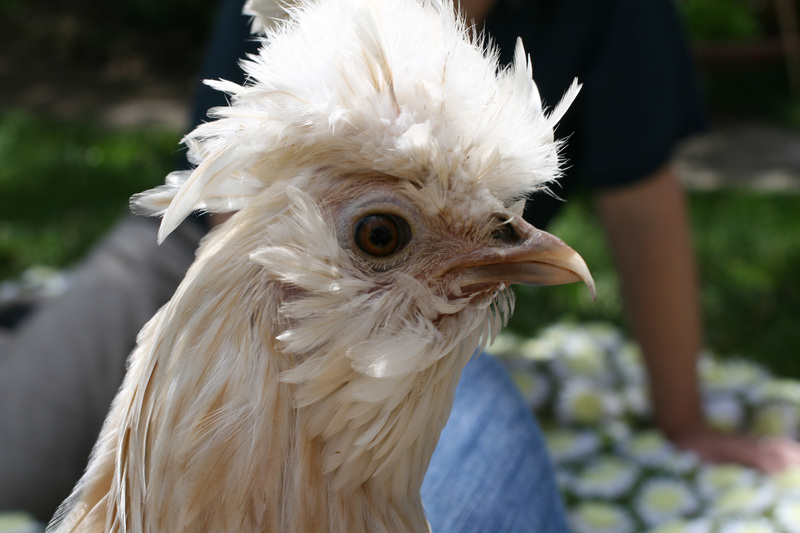 But we all know chickens are no ordinary pets. 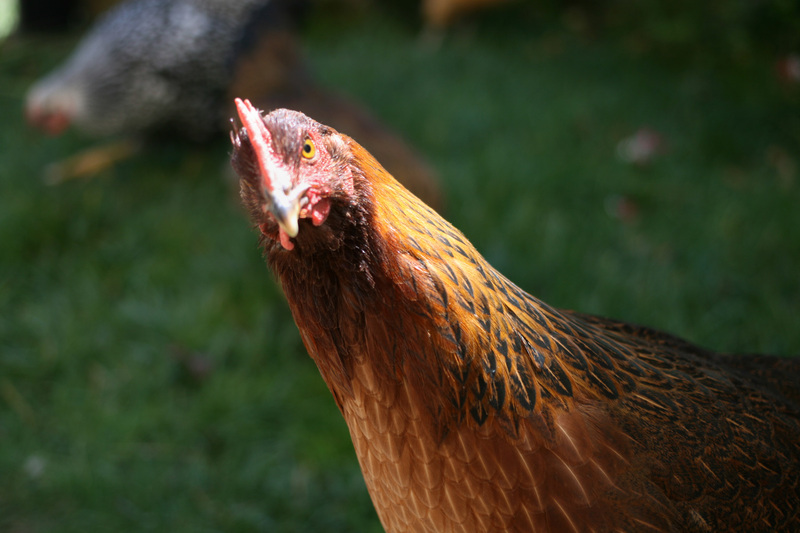 Like you, we’re wondering… when will those biddies start laying eggs? Brown and blue-green and chocolate speckled and creamy white eggs. 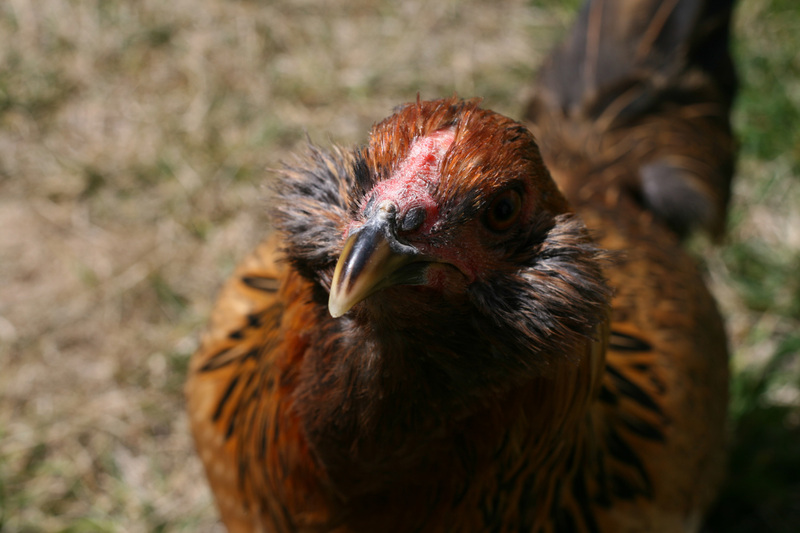 (Soft-boiled and poached and over easy and scrambled with lots of butter eggs…) Layer hens are highly variable when it comes to reaching maturity and thus, egg laying. 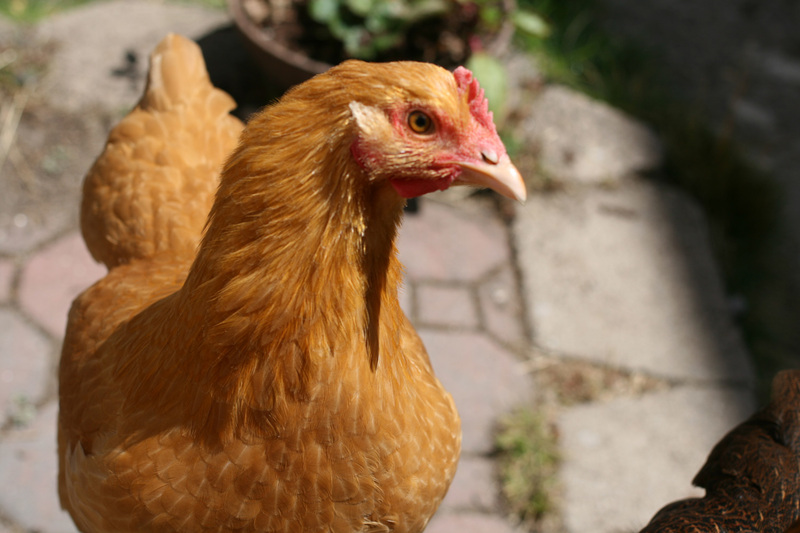 You might see the first egg at four months, or it might take six months. Or, given the season and location of hatching, it might take a year – though this is not likely for our situation! As you might guess, broad generalizations are made about all aspects of this miracle: which breeds are “early layers,” and which take their sweet time; how to identify surefire “signs” that the day is near; and hopeful home remedies to encourage the quick advancement of that day. 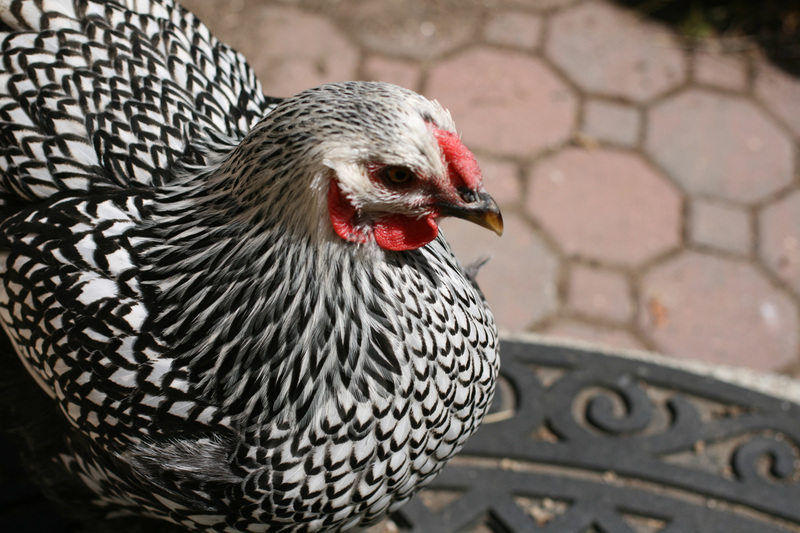 But, of course, a hen will lay when she’s ready. Still, we’re making things nice in anticipation of the big day. 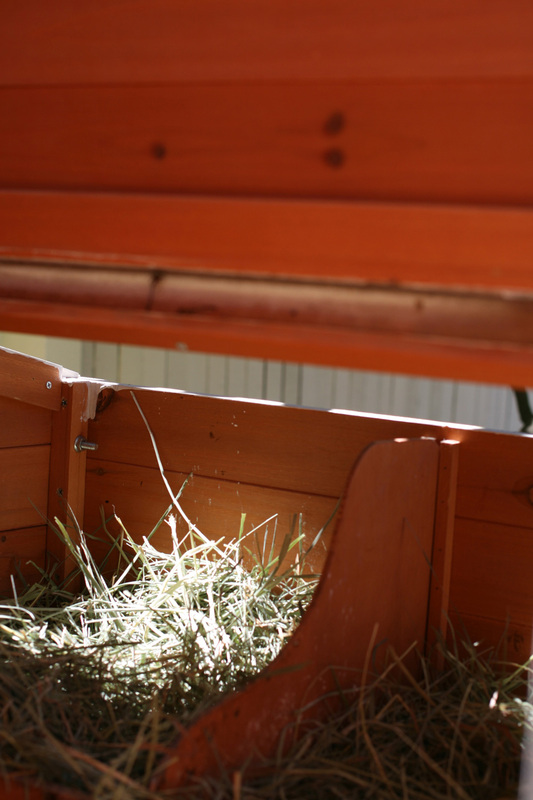 For one thing, we’ve lined their nest boxes with hay. 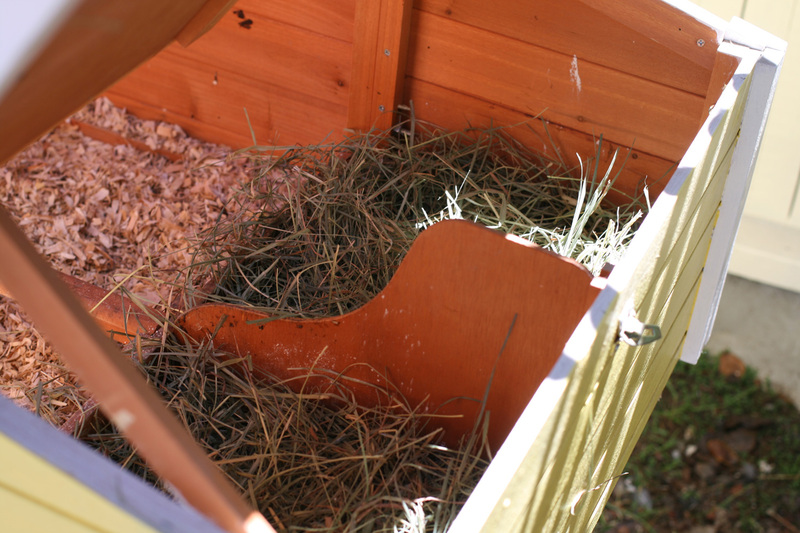 While not strictly necessary (lots of people use pine shavings throughout), adding hay or another soft bedding material to the nest boxes is supposed to help differentiate that space from the rest of the coop. Some chickens like to arrange the nest material to make a soft, special bed for the egg, and providing that here makes it less likely they’ll find some other twiggy spot in the yard to do their business. Doesn’t that look like a nice cozy, soft spot to lay an egg? Of course, the nest box lid will be shut and it will be nice and dark and safe in there most of the time, which is mostly what a hen cares about. We’re also putting some fake ceramic eggs in the nest boxes, which I’m not documenting here because I’m certain they’d cause a false alarm! 🙂 Chickens have a very strong instinct, but they also learn behaviors from their elders, and ours don’t have a role model to look up to. So we’re hoping the fake eggs will indicate that this nest box is a safe place to lay, that other, wiser chickens have chosen it and trust it, and that the girls will follow suit. It’s supposed to be kind of hard to break them of laying in an odd spot, so better to address it before it starts if possible. And finally, we’ve updated their diet to include layer feed and oyster shell, both of which offer more calcium with which to create strong, smooth eggshells. All that (probably needless) preparation and now there’s nothing to do but wait! Don’t worry, you’ll know the day we see our first genuine backyard egg. And apparently the girls will let us know too, with a glorious, notorious egg song. Can you imagine that racket coming out of this innocent face? Barbarella (Bella) is the most soft-spoken of the group. Until you pick her up, anyway. 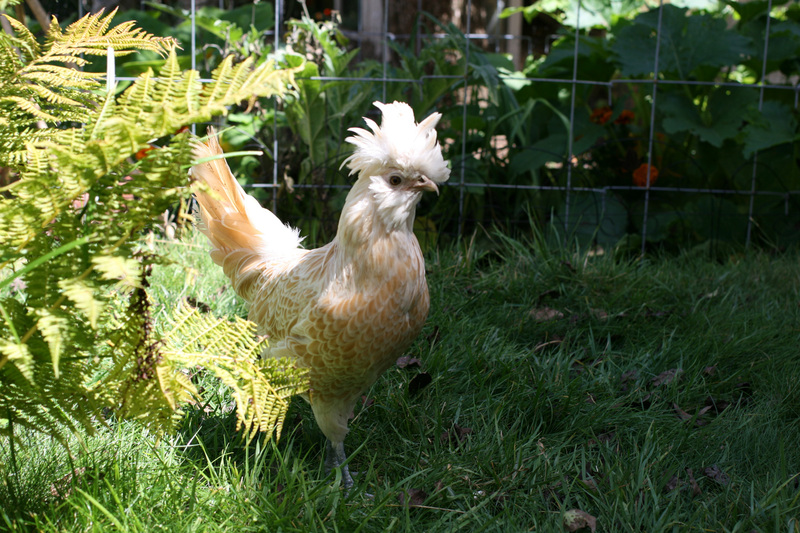 Do you like Ziggy’s new hairdo? We’re using a hairband to tie it up so she can see better. She’s much harder to sneak up on! Guin still rules the roost. For now. Oh those puffy cheeks! Dottie is by far the roundest, fluffiest pet I have ever known. She gets what she wants, most days (grapes). And Ptera is the loudest! Her egg song will surely wake us up, and she’s rumored to be an early layer – but time will tell. Happy hunting, ladies! Turn those bugs into eggs. Nom.